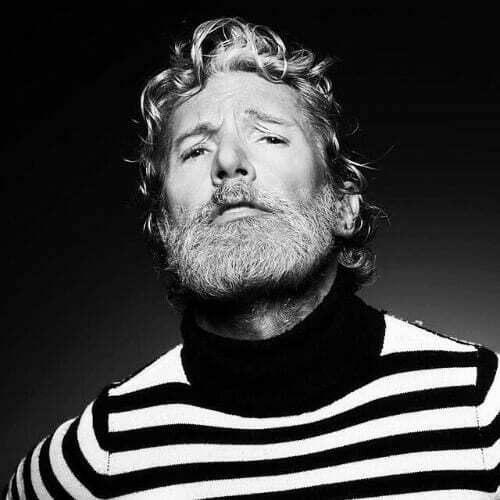 Growing old doesn’t mean you have to quit experimenting or changing your hairstyle and aspect. After all, those elegant silver highlights shouldn’t go to waste. 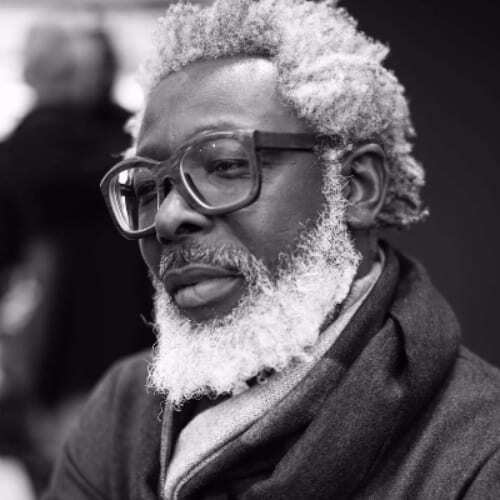 Apart from gaining wisdom and being less judgmental towards the shifting hairstyle trends, the older men we’ll present below seem to enjoy breaking the pattern with versatile and outrageous exquisite looks. 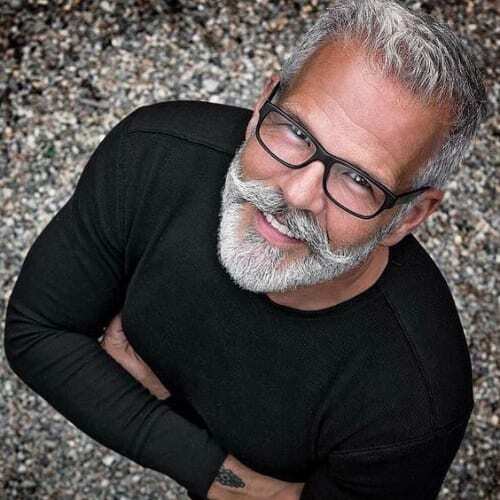 So let’s take a look at more than 50 magnificent hairstyles for older men! 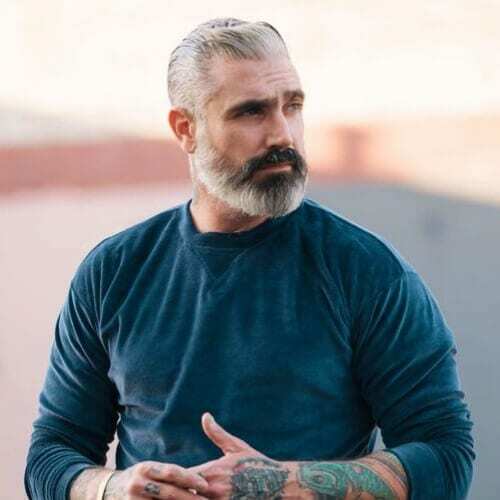 Matched with a full beard and low faded sides the pompadour hairstyle, combined with the gray highlights, gives an older man attitude and demands respect. 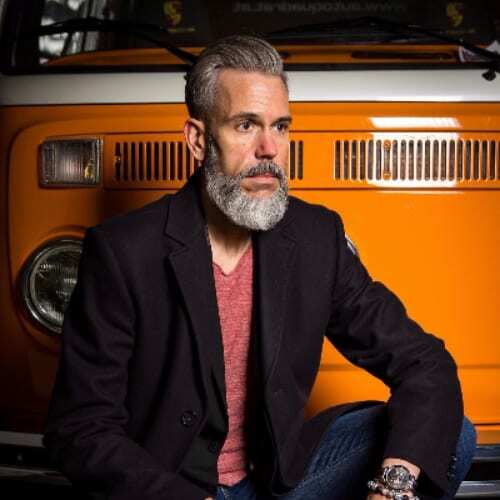 Although usually considered to be a youngster look, the undercut side part can perfectly suit a man over 50 as well. 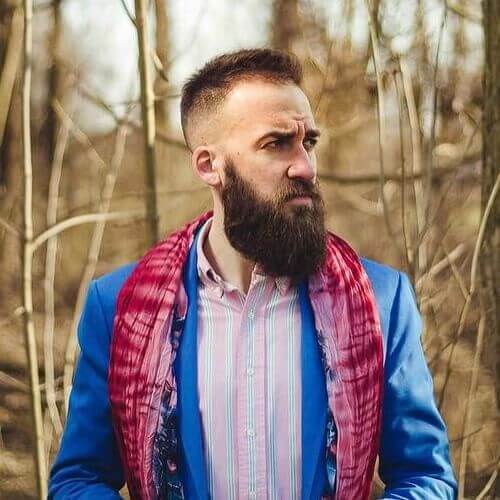 The beard is just an extra touch that will offer you more of a Bohemian look. 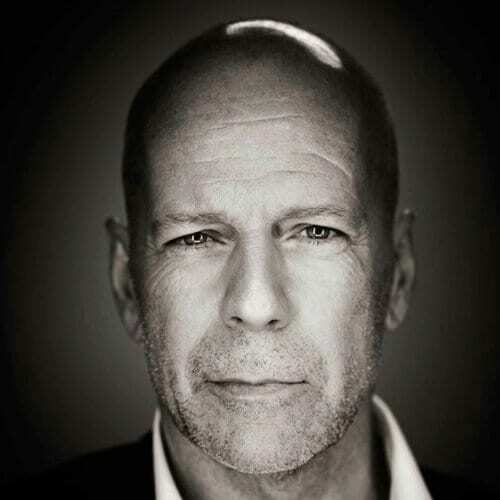 You can either proudly show off those silver locks, or you can go the Bruce Willis way and shave off your head. 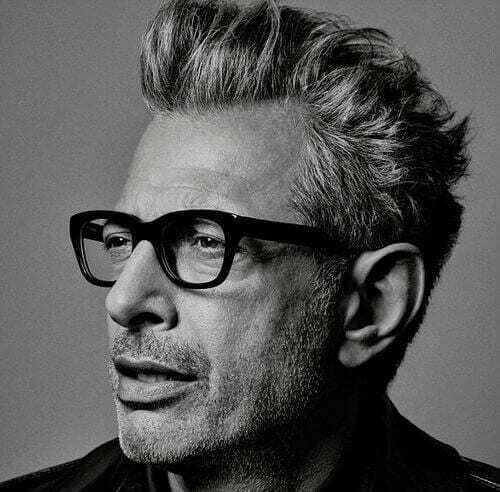 It takes some courage to go so short, but this surely is one rocking good hairstyle for older men. If you want to achieve a more natural and business-friendly look, then Jackpot! This hairstyle meets both of these requirements, it is very easy to maintain, and you can also tweak it in various ways. This blown out hairstyle will surely attract a lot of attention even if left all to its own. 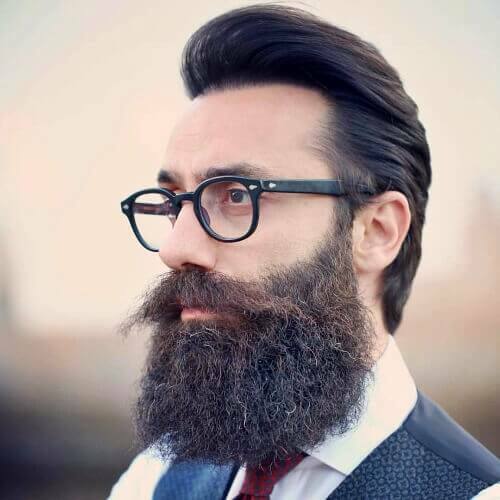 Combine it with a longer beard and moustache, put on a fancy pair of glasses, and you will be sure to turn heads and receive compliments. 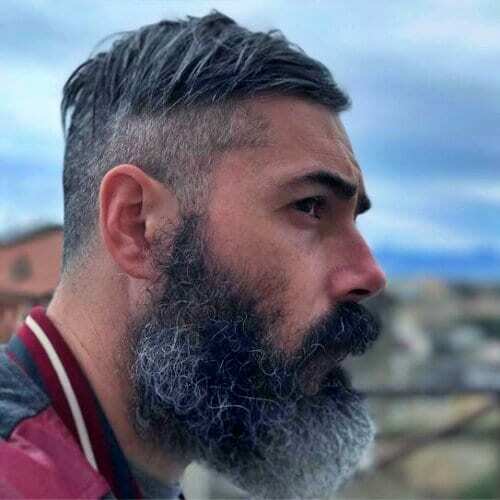 The high fade hairstyle has become increasingly popular nowadays, and what better way to wear it than with a colorful casual outfit and most of all, with a full beard. It is also a symbol among men with combed-over men everywhere, and is frequently associated with a full beard. In the above, it was coupled with a Bandholz beard. 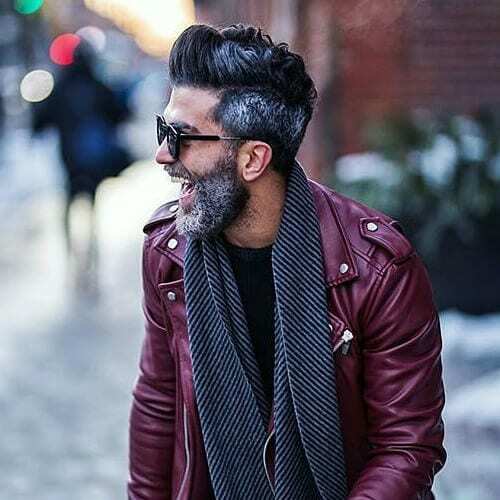 If you have a strong personality and a passion for wearing your beard with pride, then the medium length pompadour is definitely the perfect hairstyle for you! The man, the legend. 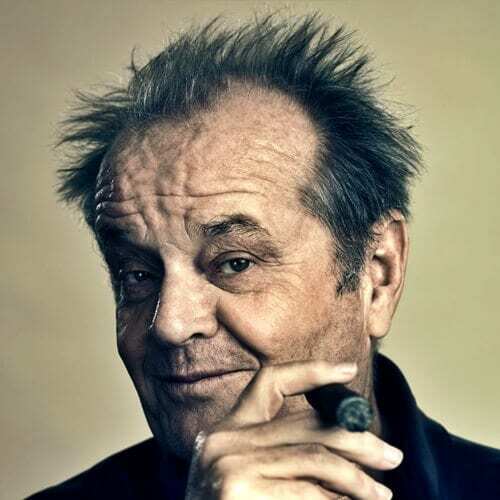 While we may never be Jack Nicholson level of cool, his messy hair, receding hairline is not a bad look. 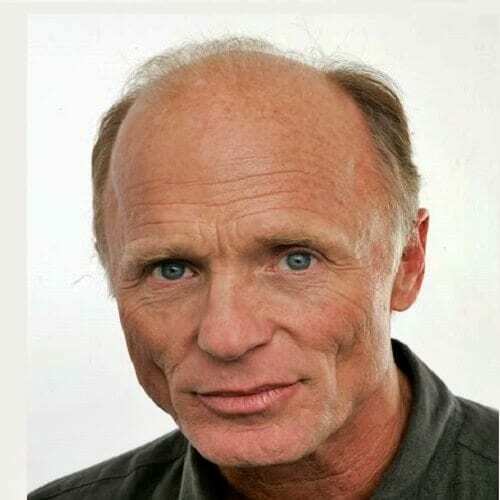 After all, a list of hairstyles for older men wouldn’t be complete without a receeding hairline idea. 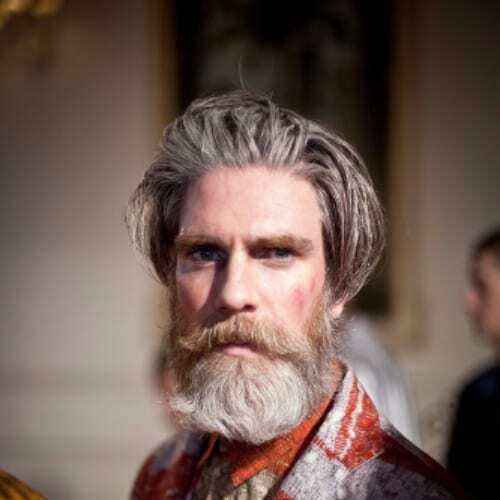 Opposite to the rebel old man is the classy gentleman with loose combed over hairstyle, ready to seal the deal. This is an easy to wear hairstyle, and especially useful in an office setting. 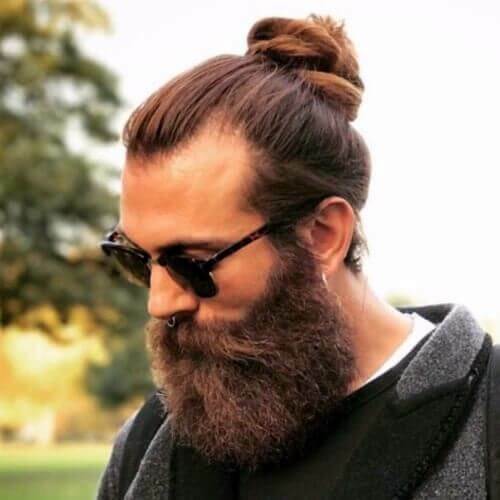 The man bun is rather a trendy hairstyle in recent years. If you want to look savage and yet modern, go for a man bun do. Add a pair of sunglasses and you’re ready to rock! While many men go for a loose and carefree hairstyle, there is another way to go, namely, the wet look hairstyle. If you consider yourself a rebel with a cause, try the wet hairstyle and give it a rugged edge by completing the look with a leather jacket. This beard style might remind you of some communities, but here, it’s as cool as it gets. 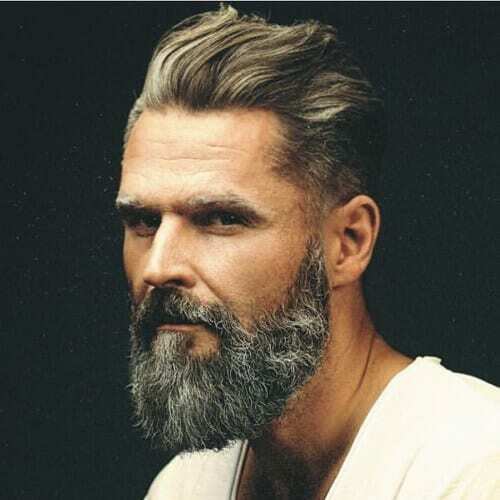 Swept back hair with short sides that are smoothly connected with the beard are a great match for a true gentleman. This precision fade hairstyle is a derivate from one of the most common hairstyles among soldiers and sailors. 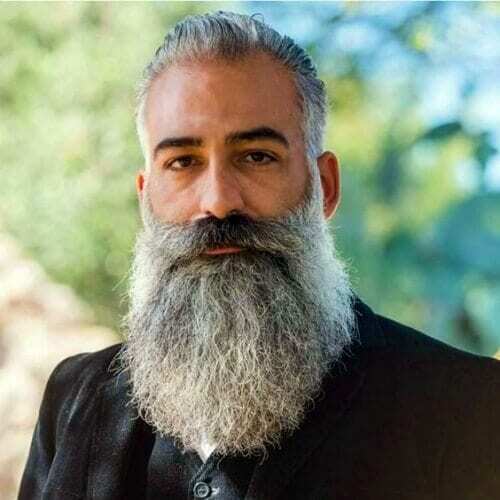 You can easily pair it with a great long beard, but remember to maintain it. Next is the messy up do hairstyle. 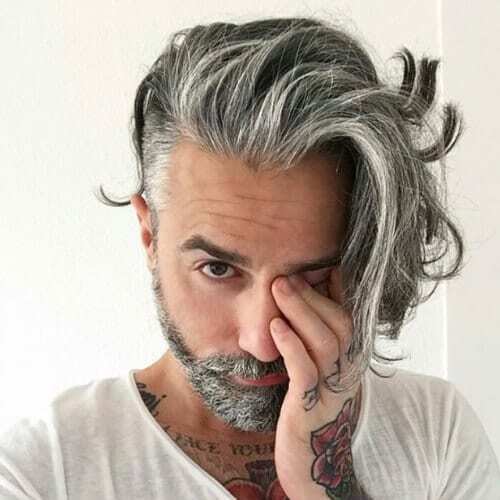 This one of those hairstyles for older men that’s ultimately about looking younger even at a more mature age. Go for short sides with a messy top, add a bit of hair powder, and you are ready to roll! 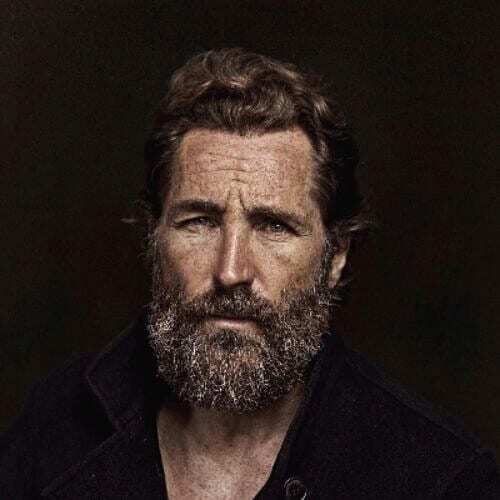 As a result of constant Hollywood productions, the natural medium curly hairstyle is, in my opinion, the most matchmaking look for any older man. A bit savage but not average, with a strong attitude and of course, with a beard is, in fact, the right choice of hairstyle. 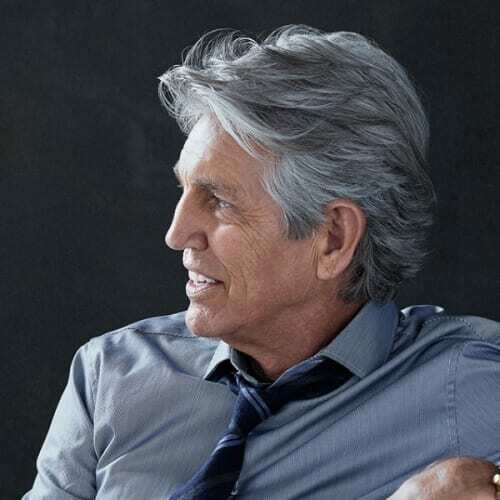 This hairstyle can easily make you look ten years younger, so it’s no surprise that it’s a favorite on many a lists of hairstyles for older men. 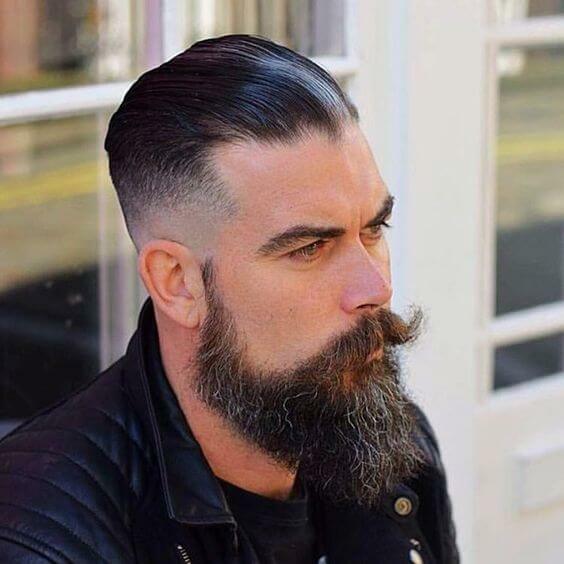 A side undercut is a great alternative to the classial haircut, and in this case, it was also coupled with a great looking beard. 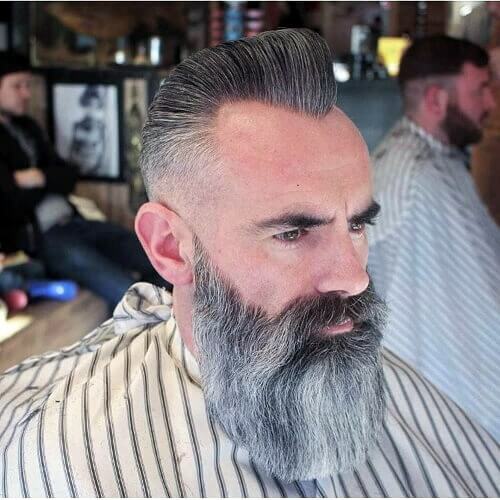 The spiked up hairstyle is taking ground among more and more elder man. 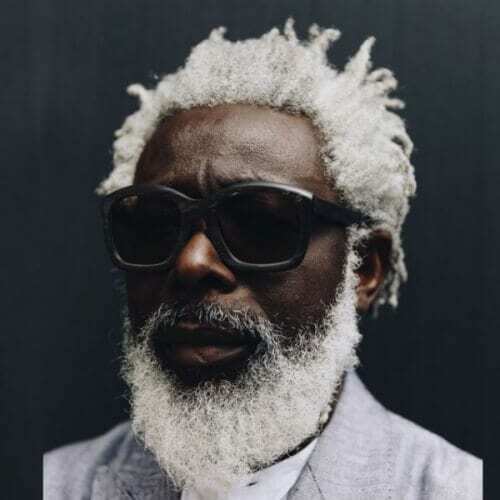 After all, it is a matter of looking sharp at any age, therefore this particular hairstyle can determine if you have the books in trends too. 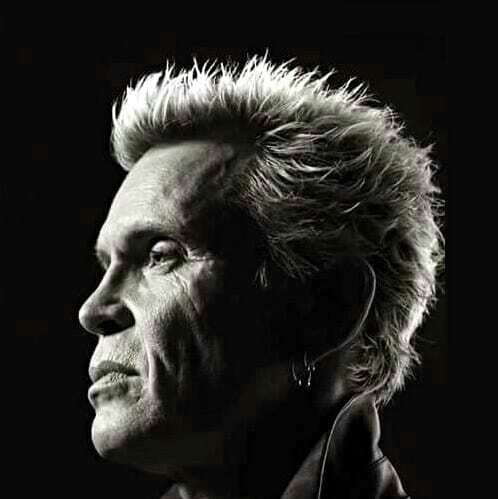 Who knows, maybe Billy Idol’s part of the reason too. A combed over loose hairstyle, made even better by a touch of natural charm, and you get the perfect look. 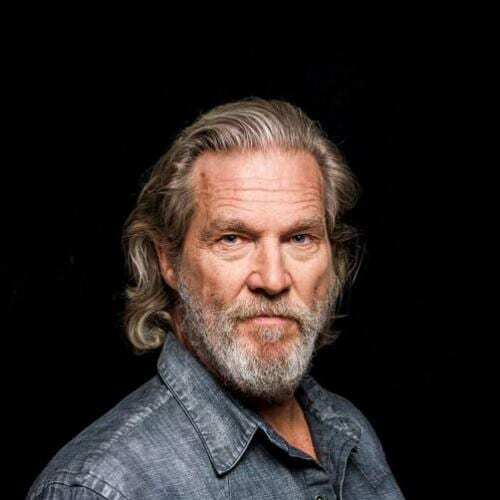 See how good Jeff Bridges looks with this hairstyle? 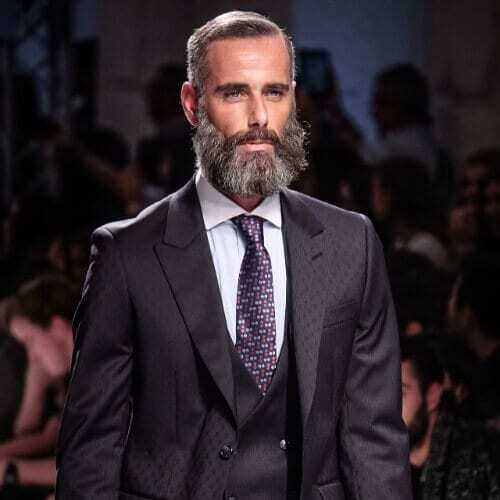 All things considered, some older men don’t say no to a career in fashion. Consequently, your hairstyle must stand out and also draw attention to your wisdom highlights. The pompadour hairstyle is, for the most part, perfect for any type of outfit. A point often overlooked, it is important to realize that by growing older, you transform your qualities into gold. 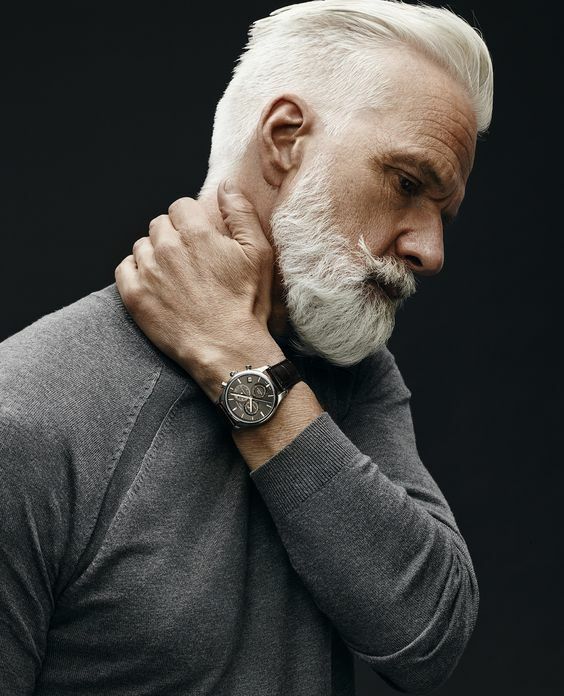 Who wouldn’t wish to have a modern grandfather with a sharp look that inspires a strong personality, and wisdom? A high up do elevates your style and your spirit. With the previous description in mind, presently, grandfathers can be even more of a rebel than their grandchildren. 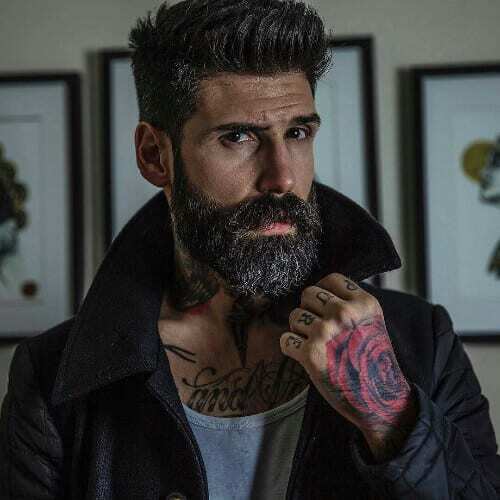 If you are a fan of heavy tattooing, heavy music, and heavy requirements in life, the pompadour on point hairstyle will bring out the heavy in you. 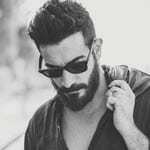 Certainly, the undercut side quiff hairstyle associated with a cool mustache and just a touch of a beard, after all, is what you are looking for. Present everywhere and in trends, it is easy to maintain and it goes well with any season and any outfit. In case you have yet to find something to meet and fulfill your demands, no worries, here is the swept side buzzed hairstyle! If you are passionate about going to the gym and boosting your confidence, this look balances everything. Add a medium length beard and you’ll be ready for anything. The classic taper hairstyle and the classy suit are such a good combination that you’ll feel like walking the catwalk even if you’re just going down the street or meeting everyday tasks. 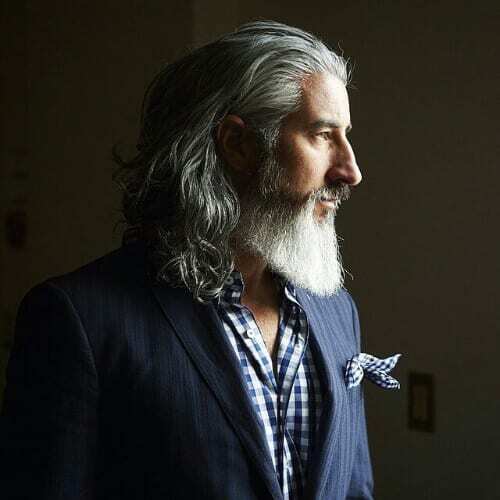 The first thing to remember is that with age comes wisdom and most older men have by now a successful career that demands a certain appearance, especially if you are keeping up with the trends. This is the classic business hairstyle, enough said. This looks like the hairstyle for older men from above, but there’s a twist. All of a sudden, business shifts to casual rebel, with a hairstyle that states this loud and clear. 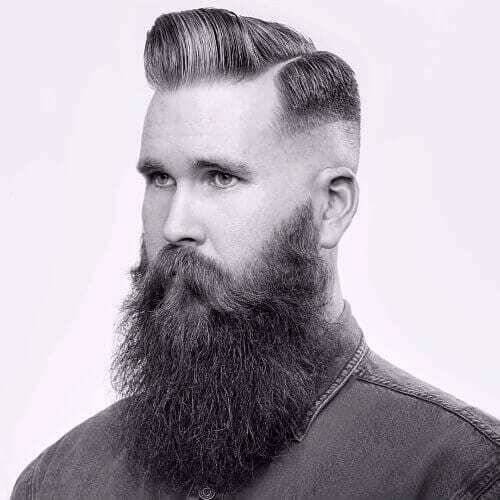 Long wavy top on one side with buzzed undercut and ultimately, the beard. It’s perfect! Aaand we’re back to business, but without having to give up the rebel side. Equally important is the business look as well. With the high top man bun, you can easily camouflage the wild side (or can you?). 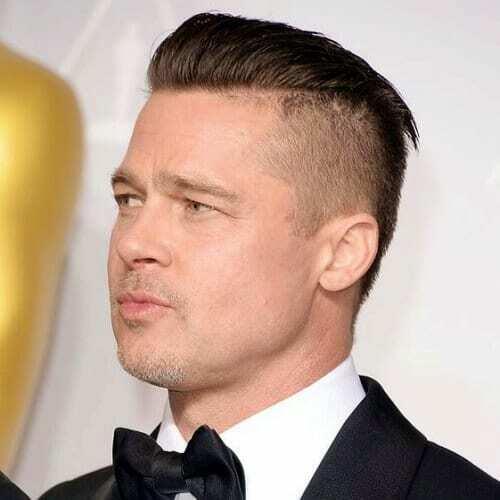 The buzzed undercut balances the top in an almost uniform shaped hairstyle. 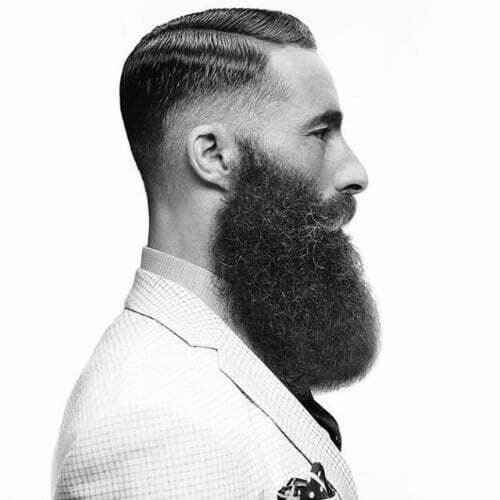 Associated with a full grown beard, the undercut taper hairstyle can surely bring out the best in a man’s apparel. It can also be quite easy to maintain, especially if you make regular visits to the barber shop. While the swept back wet look might be losing some ground, the classic swept back loose hairstyle is still a favorite because it is easy to wear and adjust, it looks natural. and brings out your features. No, you aren’t looking at a motorcycle gang member (or are you? 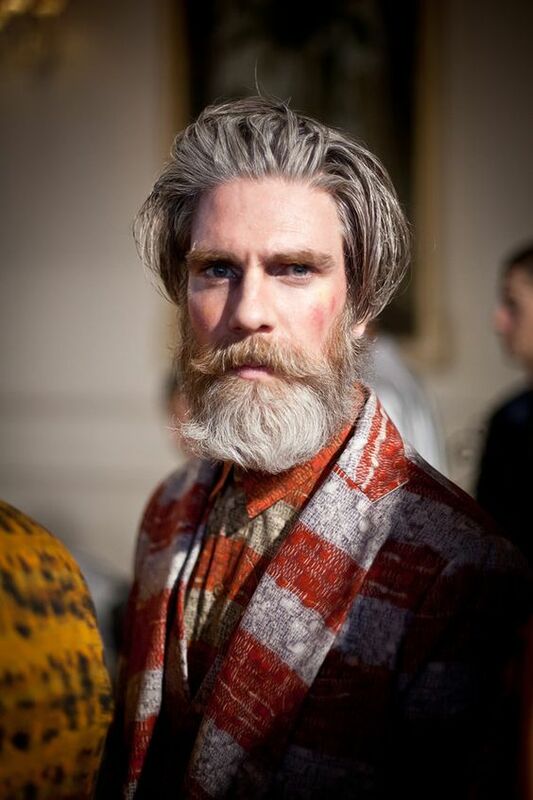 ), just a very cool hairstyle for older men, the messy taper. 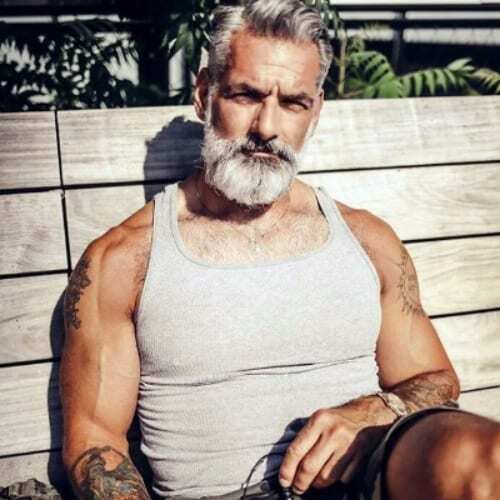 All in all, you get a very cool effect, as the graying hair goes very well with a silvery beard. A natural born curly-haired person might sometimes not be that happy with their curls or even be unsure as to what type of wavy hair he has, but you just can’t deny this: this short afro hairstyle is great! Easy to maintain, it is a perfect choice for any gentleman in his silver years that was blessed with curly hair. 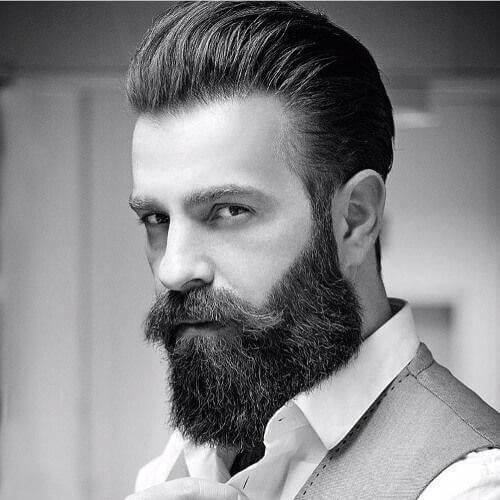 Of course, your beard can be perfectly arranged, that does not apply to your hairstyle too. The medium length hairstyle balances these two and furthermore, it gives you an unconventional gentleman look. Summer is all about relaxing under the sun and enjoying the simple things. Equally important is the hairstyle you’ll be sporting throughout the hot season. A quiff hairstyle will surely keep you cool (if you catch my drift). 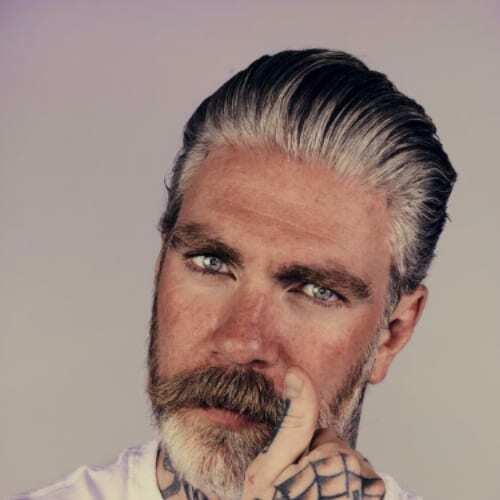 The taper hairstyle has a uniform cut with short faded sides connected with the beard and a slicked back top. It is an elegant mix of shorter and longer hair that will have you looking sharp and ready for anything. 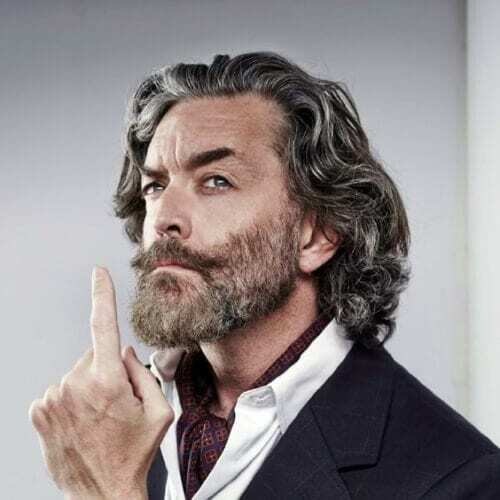 A curly top will arrange itself in no time, and so should your beard, if you opt for one. Of course, if you are not lucky enough to grow it by yourself but you really want one, you can always wear an animal on your face (don’t worry, it’s not a strange new trend). Cutting through the ladies hearts like cutting through wood, this sharp look is called the lumberjack. 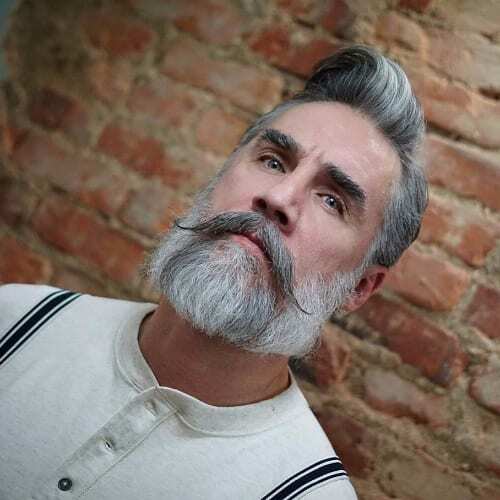 Short shaved sides with a messy top and the habitual full grown beard with a mustache, add suspenders and grab an ax because now you are ready to conquer the world. 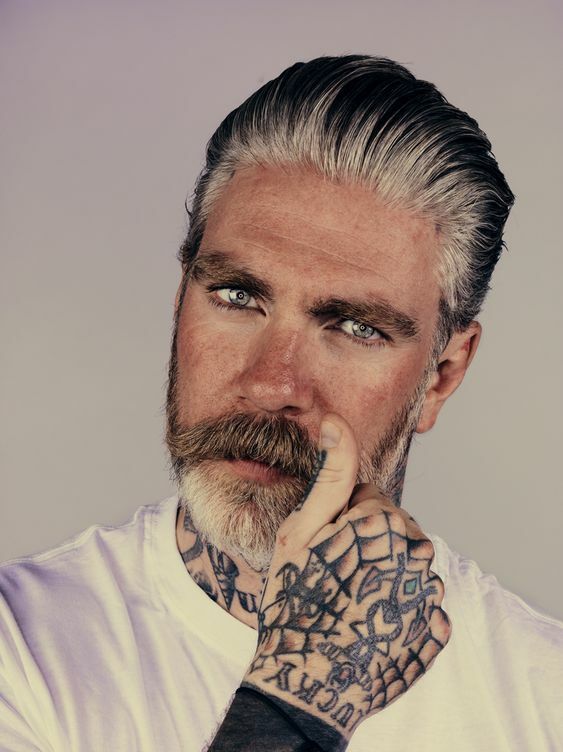 The undercut hairstyle is very common this year, mostly because it is easy to maintain, it goes well with all face shapes, you can wear it with or without a beard, and it also makes you look younger. Additionally, it is perfect for any fashion style, and why not, even award ceremonies. In essence, being yourself is the best thing you can do. Throw on a striped sweater (for a bit of French flair), run your finger through your hair, and you’re ready to start your day. The French crop hairstyle is defined by its high faded sides and the top separated with a precise line. What a relaxed pose, what lose locks. Game of Thrones‘ Nikolaj Coster-Waldau strikes a pose and makes for one great hairstyle without doing much at all. Just let those medium length strands fly loose, ideally with a side or central part (depending on which looks best) and you’re all good to go. The classical shape up hairstyle is a match made in hair heaven, especially if you have square face features. Throw in a black jacket and a confident pose, and you’ll bring out the best of this hairstyle. Not only an outfit can make you look magnificent but also a hairstyle to measure up to it. 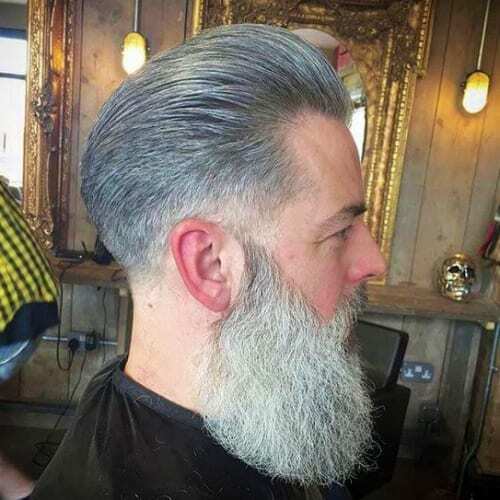 This unique style is rather bold and elegant at the same time, and a great hairstyle for older men. Maybe it’s the experience accumulated over time regarding fashion, or just an open mind, either way, hairstyles for gentlemen have a certain something of their own, and there are few quite as elegant as a neat comb over. 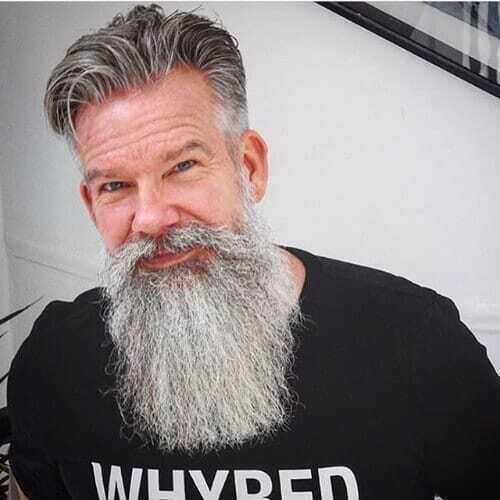 Meanwhile, if you are lucky enough to have fringe grays and also curly hair, then you just have to let those locks flow, and see if you wanna complete it with a great mustache and beard, or even both. Just look how good Timothy Omundosn looks here! 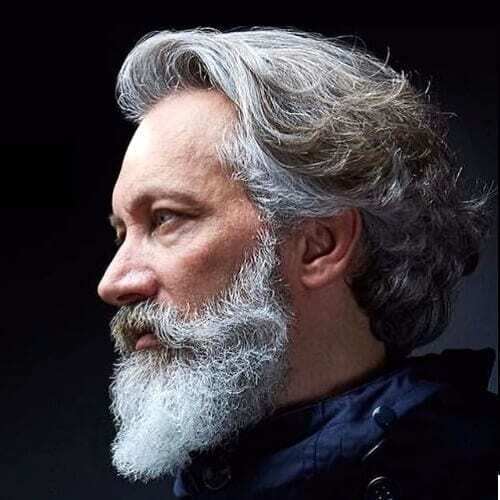 Even though messy medium hair combined with a medium length beard might make some think of the mad scientist look, this is far from being the actual case here. 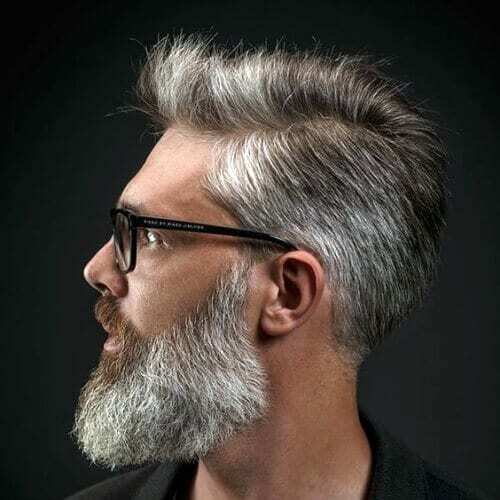 This man’s natural gradients make it look quite special, but you can be sure you’ll get a great look even with a solid color or grey locks. It’s a beautiful day to get a haircut and why not opt for a buzzed cut? 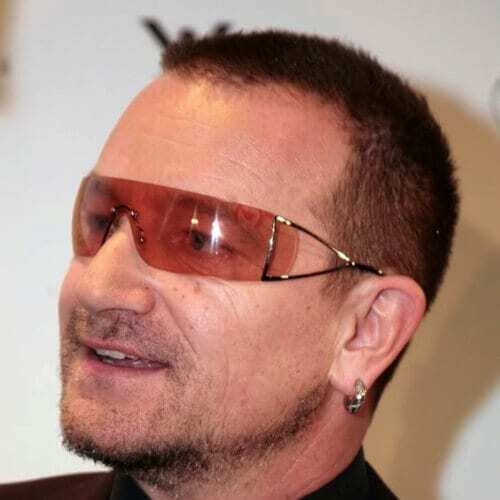 Bono completes the look with a pair of glasses (that just couldn’t miss) and stubble going for the 5 o’clock shadow look. On the other hand, a high top, side part hairstyle combined with a full-grown beard can give you, in turn, a wise or wild look. 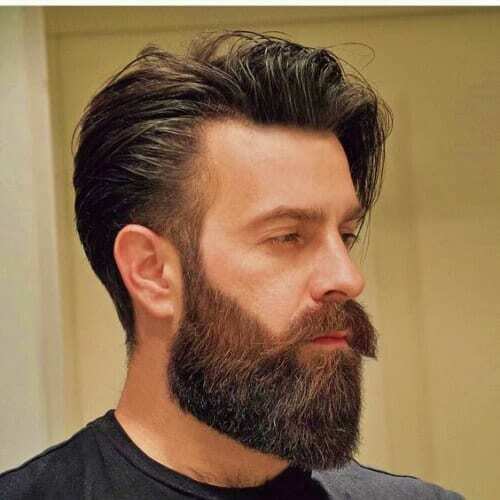 Trimming your beard or letting it loose will add to the effect you want to create but remember to trim your sides. 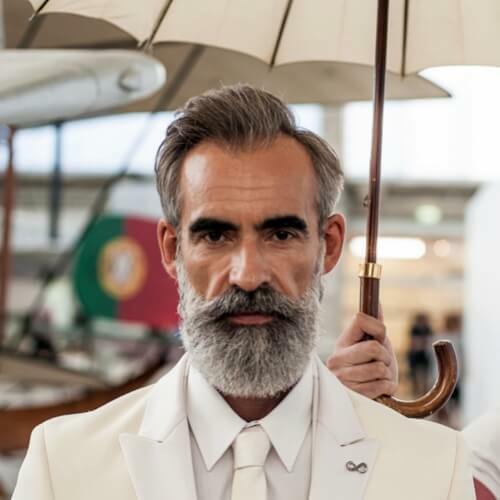 The slicked back hairstyle for older men just keeps on making history. Straight from the classical movies and up to the present time, this combed over look brings out your manly features and strong character. Give it a try! 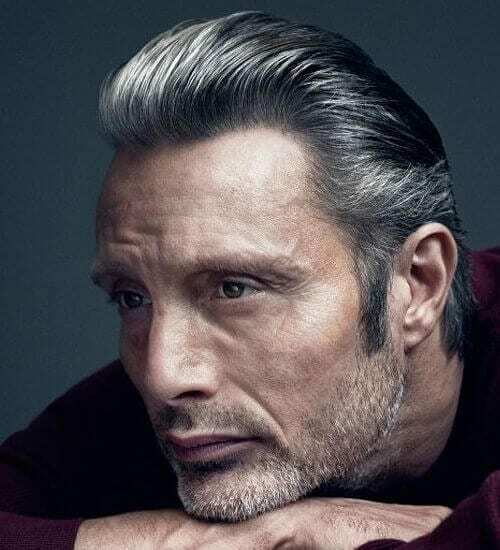 At 53, Mads Mikkelsen is a style icon and an example of impeccable grooming. 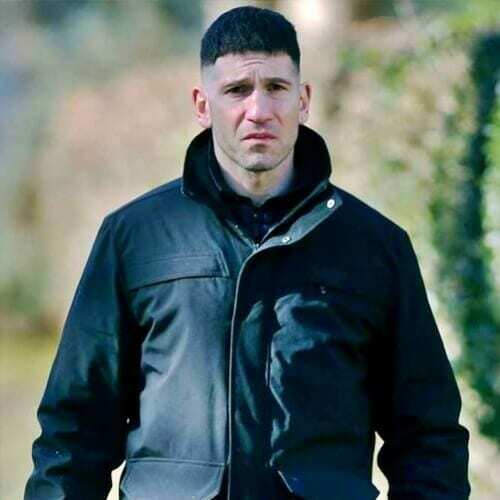 His slick hairstyle is both classic and elegant. 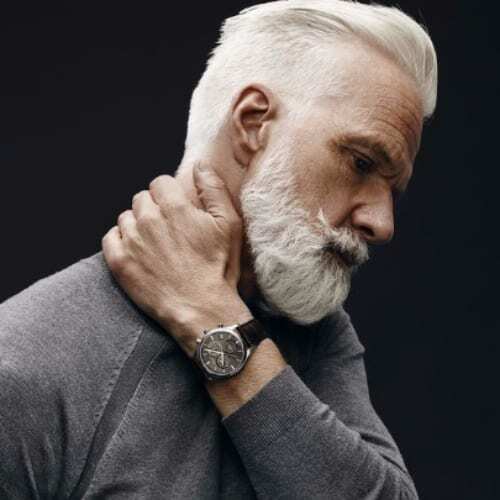 The grayish stubble completes this look that is ideal for a mature, style-conscious man. 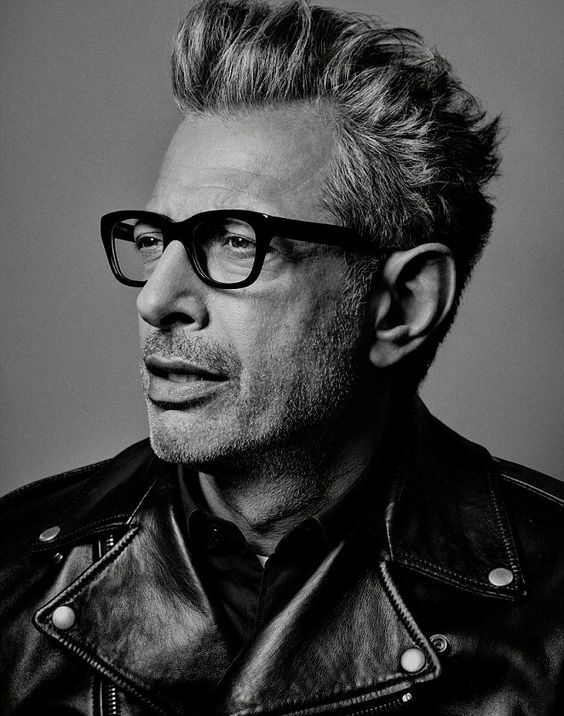 Another Hollywood star who managed to maintain an elegant look through his golden years is the beloved Jeff Goldblum. He wears a modern, relaxed hairstyle, with more hair on top and short hair around the temples and back of the head. Stylish, simple and cool! 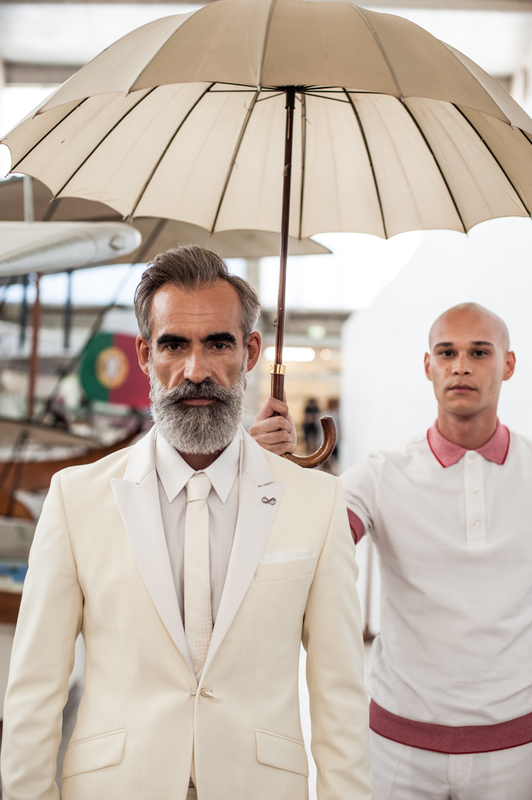 If you’re looking for something with no beard, this look is definitely one worth trying out! It might seem like there’s no rhyme or reason to it, but if you look over at the sides, you’ll see some precise grooming work there. Top notch! 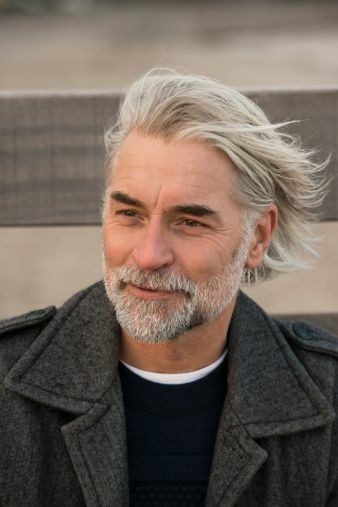 Ultimately, the best hairstyles for older men are also about finding a balance between your personality and your way of life. Even if you are growing older, that doesn’t mean you have to stop playing around with your hair and experimenting. After all, you should pick a hairstyle that makes YOU happy! Why do 48 out of 50 have beards? 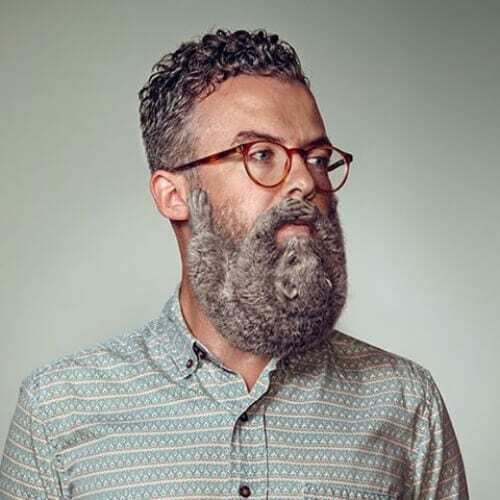 Are beards a massive component of today’s styles that fit the tastes and lifestyle for roughly 96% of men? 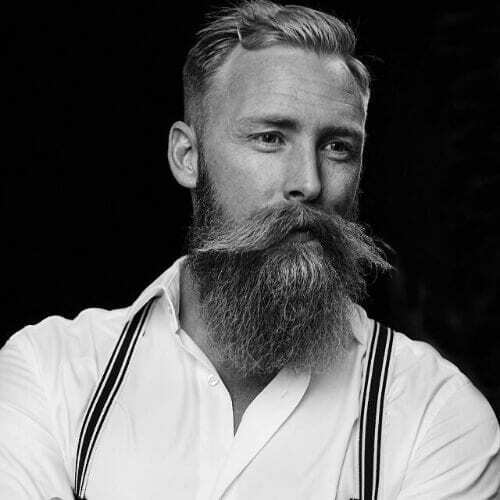 Or are the beards not a defining part of the style examples above? We are aware that most of the images in the article depict men with beards. 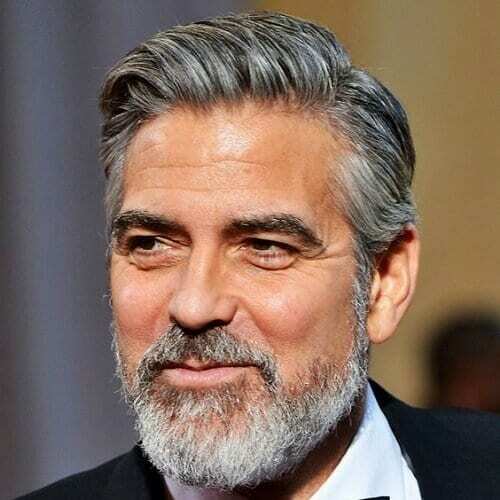 However, the hairstyles can easily work without the beard, if you are not a fan of facial hair. Indeed, this is a very fashionable trend that will carry on into 2018. Maybe by 2019 some of these hair styles will have added 1/2″ per month as mine has and is now mid back length. Much more versatile such as bun for business, braid for weekend adventures or just blowing in the wind for a relaxing weekend. I’m 60 years with no intentions of going shorter. O.K.! I suppose I’m just going to be OUT of style!! None of these cuts appeal to my woman or me? Hello Jeffery, the hairstyles you have mentioned in your blog are superb! 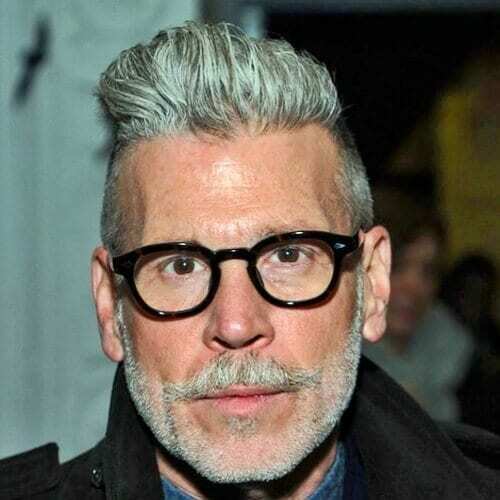 These hairstyles will definitely give stylish and glamorous look to older men. Thanks and keep sharing. My hair is very fine and quite thin in the back. Which of the 53 haircuts in Pinterest will be most appropriate for me?